The UFC’s Facebook page kicks off the festivities by streaming two preliminary bouts live starting at approximately 7:20PM ET/4:20PM PT. FX will then air four more freebie fights beginning at 8PM ET/5PM PT. The pay-per-view broadcast starts immediately after at 10PM ET/7PM PT. 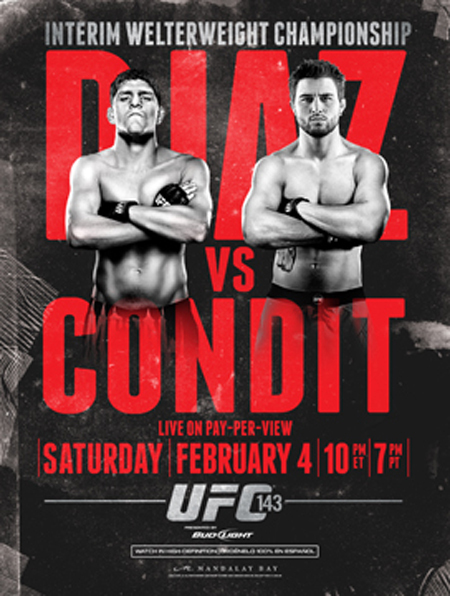 An interim welterweight title tilt between Nick Diaz and Carlos Condit headlines the show, while Roy Nelson welcomes Fabricio Werdum back to the big leagues in the co-featured attraction. Mandalay Bay Events Center in Las Vegas, Nevada hosts the extravaganza.